Be immersed in coastal luxury. Live your story by the sea. Seconds from Clovelly Beach, this stunning coastal masterpiece presents three individual full-floor apartments – each with three extravagant bedrooms and three designer bathrooms. The year-round tranquillity and beauty of Clovelly Beach is an extension of this exclusive boutique address. This is your story. Your life. Be immersed in it all, here by the sea, in incredible luxury. Featuring signature interior design furnishings by Coco Republic, a magniﬁcent atmosphere for relaxation and inspiration is assured. At Sea you can be your best. First light, every day, every night. This coastal grandness must be lived. Defined by a brilliant balance of superior architecture and elegant interiors, Sea, Clovelly is the embodiment of extravagant seaside living. Enriched by heavenly ceilings, polished timber floors, stone marble, gold detailing and immaculate bay windows – the luxurious interiors will inspire and soothe the senses. With wondrous natural light, the sensuous design layout presents overly generous spaces and an indoor-outdoor harmony with Clovelley’s coastal surroundings. The truly tremendous terrace and building’s breathtaking design heighten the experience further. The impressive kitchen includes a Concordia Marble feature wall, European appliances, dark grey honed marble benchtops and Platinum chrome finish tapware. Synergising with the carefully conceived architecture, Coco Republic’s interior design shares a contemporary style with a very welcoming coastal feeling. Combined with the sought after location and alluring seaside setting – you will want to be here. Revel in it all. Retreat from it all. Again and again. Here at Sea, Clovelly you have that luxury. Perfectly positioned just footsteps from the beach, enjoy the oceanic surroundings of Clovelly’s exquisite village while only being minutes by car to Westfield’s playground of brands (over 400 stores). Panoramic green open spaces are an easy stroll away, like the seafront trails for your anytime fitness adventures. A superb range of restaurants, bars and cafes reside in your surrounding area. And if you choose to keep it local, mouthwatering delights await: Relax with sea views and art deco ambience at the Clovelly Hotel or step to the Deviate Café & Restaurant for delicious slow roasted lamb and soft crab shell sliders or try the Chef’s superior selection (a memorable meal of 6-8 courses). Sydney International Airport is just 20 minutes away too. This location enjoys the best of worlds. You’re close to everything while always being able to retreat to your serene, coastal village address. With Bronte to the north and Coogee to the south, the Coastal Walkway is your path to sensational scenery and selection of bays and beaches.A superb range of restaurants, bars and cafes reside in your surrounding area. Perfect for meeting friends and family, nearby Coogee Pavillion may tempt you with its Daily Sashimi Platter and sublime seaside setting. Or stay in Clovelly where more ocean views and mouthwatering delights await: Relax with fine food and art deco ambience at the Clovelly Hotel or step to the Deviate Café & Restaurant for delicious soft crab shell sliders. Although downtime is key, it’s not all about swimming and snorkelling at Sea. 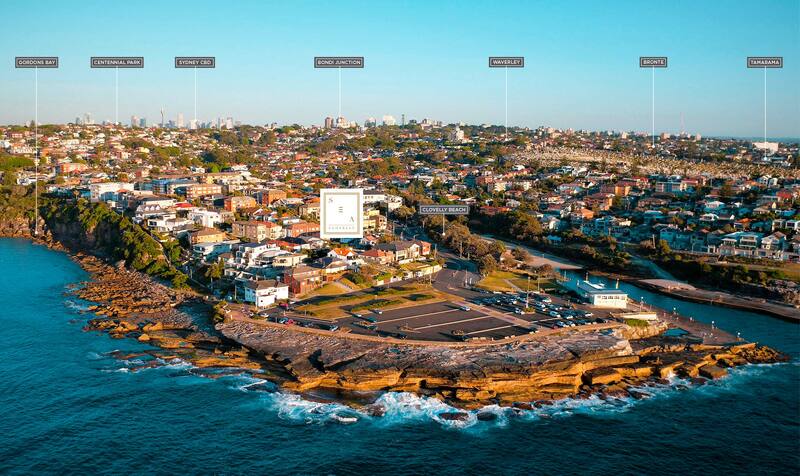 In minutes you can drive to Westfield Bondi Junction for its famous playground of brands. Featuring over 400 hundred stores, including David Jones, Myer, Harris Farm Markets, Event Cinemas and much, much more. Images are computer generated and indicative only. Completed apartments may vary from the images shown. This website is intended as a general guide only and should not be relied upon in making a decision to lease all or any part of the property. Not any of its Related Bodies Corporate (as defined in the Corporations Act 2001) make any representation or warranty that any information contained in this website is accurate, nor do they accept any liability for harm, loss, costs or damage arising from the use or reliance on the information and are hereby released from all liability of any nature arising out of any loss of damage suffered. COPYRIGHT © 2016 SEA, CLOVELLY.